The legends say that the land will writhe in turmoil until the Once and Future King sits at the throne of England and wields before him the legendary Excalibur. Once this is done, the health of the king matches the health of the land and all our world can be saved. In a mythology belonging to the western world, it is a sad belief that due to the misunderstanding of the Lady of the Lake, a knight of purity who was meant to come and aid Arthur was instead left behind in Avalon and jealousy was left to fester in Arthur’s heart and our healed land and certain future was stolen away from us all. But, all myths have a hidden bit of hope lain within. Arthur is the Once and Future King! Destined to be reborn in the modern world, the reincarnated Arthur will find Excalibur and give our lands a chance, once again, to heal itself from a few hundred years of some serious breaking. Wielding the Singing Sword aloft, in whatever form it might take, we will see that shining beacon of hope once again and, this time, we might be able to avoid the same mistakes! Well, we are pretty sure that Arthur is going to appear in a modern form rather than the knight of legends from the past, but who knows! 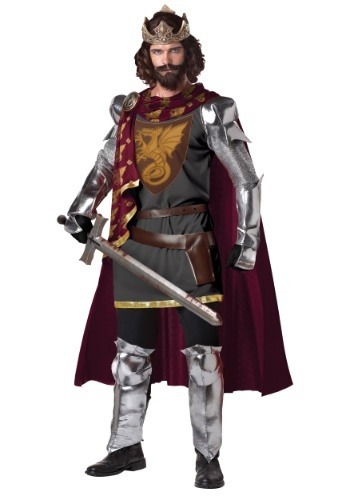 Better safe than sorry, so you should attempt to prove that you have the right stuff in this King Arthur costume. This smoky gray tunic has printed shield and dragon iconography on the front and the metal knit mesh sleeves take on the appearance of chain mail armor. The solid red cape speaks of your mighty rulership and its gold trim and dragon print shows your namesake: Pendragon! Gauntlets and leg armor protect you from possible attacks from Mordred, but your leather belt has a built-in sheathe to hold your mighty sword.That, however, you will still need to find! Perhaps after you have this costume in hand you might find the mighty Excalibur to complete the look and save our future! 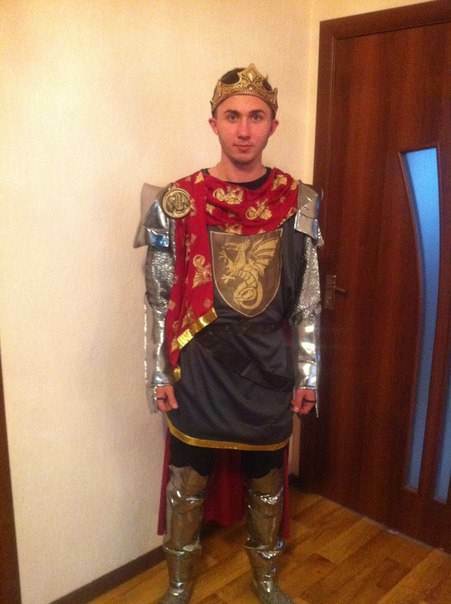 This was a great costume.